Holly Young is an extremely talented Milliner based in Truro, Cornwall. We are so lucky to have her right here on our doorstep! Holly graduated from the London College of Fashion in Costume Design for the Performing Arts. Whilst studying, she interned with the English National Opera Millinery department and on graduating worked for avant-garde milliner Justin Smith. Holly has also worked for the top milliner Philip Treacy producing headwear for Paris and London couture fashion weeks. Currently she freelances for the Royal Milliner Jane Taylor during Ascot and other busy periods. She has been very busy enchanting Royalty with her creative and wonderful designs. Recently Holly met with Prince Charles and Camilla at the Cornwall Crafts Association, 40th Anniversary (of which Charles is the Chairman). Camilla is an avid fan of Philip Treacy who Holly used to work for so, they chatted about him and both Prince Charles and The Duchess of Cornwall complemented her on her stunning work. 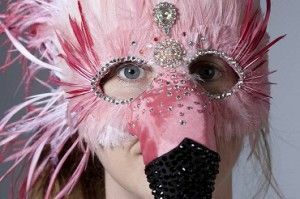 She was invited to create masks for a Charity Masquerade Ball in aide of the Elephant Family charity which hosted The Animal Ball in July. The ball was hosted at Lancaster House with The Prince of Wales and The Duchess of Cornwall present. A huge amount of £600 000 was raised for the conservation projects across Asia. 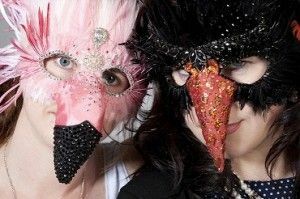 Holly created two stunning Animal Masks that where worn at the event. The guests that attended the ball where the likes of Jerry Hall, Poppy Delevingne, Rupert Everett with Jools Holland entertaining everyone with his Rhythm & Blues Orchestra. Holly has also recently graced our screens and was on ITV Westcountry talking about her new feather tiara collection. Very exciting news is that Holly’s work will be on display and featured in Bristol's new and only hat shop called the Milliner's Guild which opens its doors at the end of September this year. On a local level a new bridal shop ‘The Bridal House of Cornwall” in Truro, will be stocking her work and Holly will be running her Fascinator for hen parties which is all very exciting.